Published in The Oklahoman from 3/14/2004 - 3/20/2004. 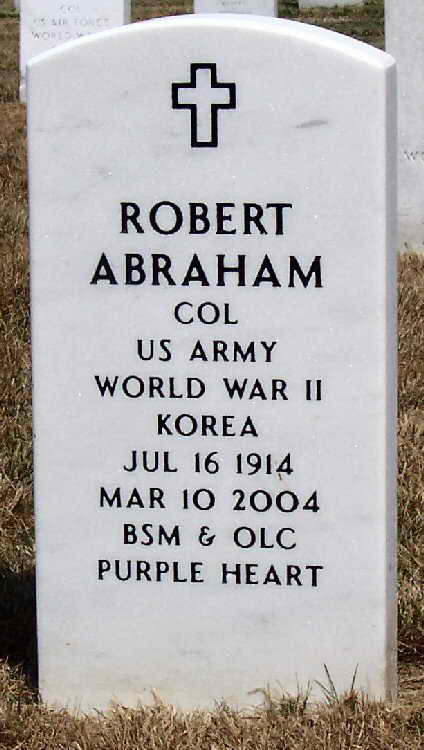 Col. Robert (Bob) Abraham (U.S. Army, Retired), 89, died at home with his daughter by his side on March 10, 2004. He fought his lengthy illness with dignity and independence, not wanting to burden anyone. Bob was born on July 16, 1914 in Richmond Hill, NY, the only child of Saul and Lillian deGrasse Abraham. His mother, father (who ran the USO camp shows for Bob Hope during WWII and was also Manager of the famed Billy Rose Theater) and extended family were in theater and show business and Bob had the privilege of knowing many celebrities while growing up. He graduated from the New York Military Academy in 1932, but took a detour into the world of finance for a number of years as a Security Analyst on Wall Street. Bob enlisted in the Army in February 1942 and began his active duty at Camp Wheeler, GA. He was commissioned as a Second Lieutenant upon completion of the Infantry Officer Candidate School in May 1942. He was later stationed at Camp Mackall, NC. It was at Camp Wheeler that Bob met his wife, Alice Lillian Ristine, a Captain and RN in the Army Nurse Corps. The two married in November 1943 in Chesterfield, SC and were immediately shipped to different theaters in WWII. While Alice was serving in the Southwest Pacific Theater as Chief Nurse of the 820th Medical Air Evacuation Squadron, 5th Air Force, Bob was shipped to the European Theater for training missions in Northern Ireland and England. Later, as a Company Commander and Captain in the 82nd Airborne Division, 508th Parachute Infantry Regiment (activated in October 1942 at Camp Blanding, FL), Bob parachuted into Normandy, France on D-Day in June 1944. He made his second combat jump in September 1944 when he parachuted into Nijmegen, Holland in a mission to relieve the pressure on trapped British and Polish paratroopers in Arnhem. In January 1945, while near the Belgian-German border, in the Battle of the Bulge, his position came under fire by a German tank and subsequent injuries forced him out of battle for the duration of the war. Bob ended this first chapter of his military service with another unit in December 1945. He returned to NY and Wall Street accompanied by Alice, who gave birth to son Robert Ristine in May 1946. His stint on Wall Street was brief, as he missed the military and returned to it after receiving a commission as Captain in the regular Army. After Advanced Infantry training at Ft. Benning, GA and Counter Intelligence training at Ft. Holabird, MD, Bob, accompanied by his family, spent four years in Germany with the Counter Intelligence Corps, implementing the security phase of the Army's role in the Displaced Persons Act of 1948. Returning stateside in 1952, Bob was on leave in NY with his wife and son when Alice gave birth to daughter Deborah deGrasse in January 1952. Within months, the family moved to Bob's next posting at Sandia Base, NM, where he served as Director of Security and Intelligence for the Armed Forces Special Weapons Project for three years. During that time, Bob observed the historic detonation of a nuclear device, Climax, 61 Kilotons, at the Mercury Proving Grounds in Nevada on March 17, 1953. After school at the U.S. Army Air Defense School and the U.S. Army Command and General Staff College, Bob and his family were stationed at Ft. Benning, GA for three years where he was with the 82nd Airborne Corps as an Instructor in tactics and airborne-air mobility techniques at the U.S. Army Infantry School. In that time period, he also attended the Industrial College of the Armed Forces. From 1960 to 1963, the family was stationed at Ft. Buchanan, Puerto Rico where Bob served as Assistant Army Advisor to the Army Reserve before returning stateside to Ft. Bragg, NC. There he was an Operations Officer in Headquarters, XVIII Airborne Corps for two years before his three-year tour was interrupted by the U.S. intervention in the Dominican Republic in April 1965. There he served under Gen. Palmer as the Director of Plans and Operations heading up a joint staff composed of members of the Army, Navy and Air Force. In the summer of 1966, Bob took his last regular posting in Oklahoma as Senior Army Advisor to the Oklahoma Army National Guard. Bob served under the late Maj. Gen. LaVern Weber, who prevailed upon him to retire early and take a gubernatorial appointment as Executive Officer and Assistant Department Head of the Oklahoma Military Department. Months later, he received his next gubernatorial appointment to the position of Deputy Adjutant General of the Oklahoma National Guard where he remained until late 1971. Over the course of his military career, Bob was awarded the Bronze Star with Valor and two Bronze Oak Leaf Clusters; Purple Heart; Presidential Unit Citation; Legion of Merit; Joint Services Commendation Medal; Army Commendation Medal; American Defense Service Medal; American Campaign Medal; WWII Victory Medal; WWII Occupation Medal with Berlin Airlift Device; Europe/Africa/Middle East Medal with Arrowhead; National Defense Service Medal; Combat Infantry Badge; Parachute and Master Parachutist Badges; Armed Forces Expeditionary Medal; French Fourragere; Belgian Fourragere; Military Order of William; and, the Netherlands Orange Lanyard. Bob retired in earnest from full time work, but occasionally took temporary assignments with Manpower Temporary Services. He also busied himself as an arbitrator for the Better Business Bureau assisting dissatisfied car owners in the mediation process with auto dealerships. By far and away, however, his passion after retirement was his beloved 508th Parachute Infantry Regiment Association and the men of the 508th who fought with, for and over him in WWII. Up until near the end, Bob was in touch with his fellow 508ers, as well as many lifelong friends both inside and outside the military. He eagerly attended 508th annual reunions, many with his daughter, but became too ill to do so in 2003. He was actively involved in the Association, serving in different capacities to promote and preserve the honor and history of the 508th, which has been memorialized in several books and in its museum at Camp Blanding. Bob loved reading and was exceptionally well read in many subjects, subscribing to ten newspapers and countless periodicals. He had a keen interest in political and military affairs and loved watching C-Span, the cable news and history channels, as well as old movies. He loved OU football and held season tickets for many years. He also attended many games with Deborah at her alma mater, OSU. Bob enjoyed backyard bird watching, his cats and his daughter's dogs. Besides his daughter, Deborah Abraham, he leaves behind his son-in-law, Robert Gawel, both of whom reside in Colleyville, TX. His wife of 59 years preceded him in death in September 2002, as did his son, Robert (retired U. S. Navy officer) in October 1992. I thank the staff of both Carter Hospice and Dr. Matt Wong for Dad's care and give special thanks to Ann Brock. My deepest appreciation is for my supervisor in Washington, DC and the Oklahoma City staff of USDA's Risk Management Agency, for allowing me to temporarily work in OKC to care for Dad. To the 508ers who kept in especially close touch with Dad while he was ill, I repeat a message he wrote to them years ago: "Take care, good and true friends! The days are truly dwindling down to a precious few, and they must be shared." As he requested, no local services or memorial will be held, but Rob and I invite friends, coworkers and neighbors to visit and share memories on Saturday, March 20, 9:00 to 5:00 at his Bethany home at 3824 Riverside Drive. In lieu of flowers, donations can be made to the charity of your choice. 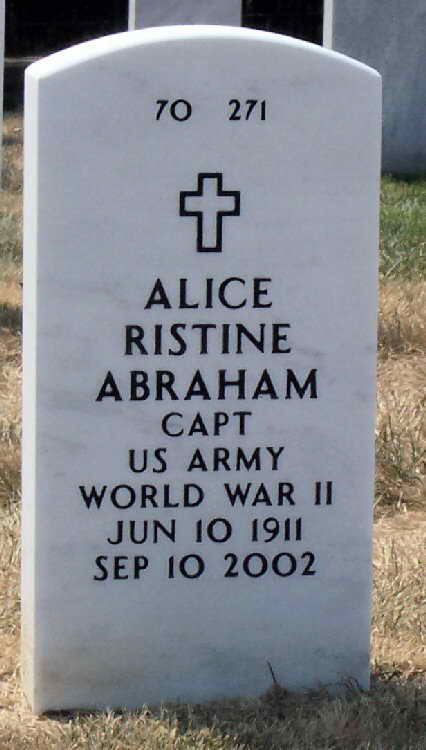 Bob's and Alice's ashes will be interred near their son's grave in Arlington National Cemetery in a double, full honors military funeral and graveside service at 1:00 PM on May 6, 2004. Robert Abraham [1914 - 2004], a well known and respected Captain during WW-II remained on active duty and retired as a full Colonel. Directly behind this gravesite is the wall of the Pentagon that was struck by the terrorist high-jacked aircraft on 9/11/2001. His grave (Plot 70, Site 271) is directly adjacent to that of Melvin Pruitt, also of the 508th. As the first to be laid to rest in this stacked grave, she occupies the bottom level. This thumbnail biography about Bob Abraham's service career, we were informed by Irv Shanley, appeared in the "Army Register," which used to be published annually, and listed all Regular Army Officers. The publication was discontinued about 1970. "As you can see, they used a lot of abbreviations to save space, said Irv when queried about the text. "There probably was a listing of the abbreviations used with explanations at the front of the book." "You are right," he continued referring to our supposition. "about 'AUS' being used for Reservists and RA for Regular Army. Abraham's service number ('O' for Officer and then just five numbers) tells me he was RA. They assigned him this ASN when he was integrated into the Regular Army. During WWII he was a Reserve Officer on active duty with a different ASN." Irv continued, "Here is my interpretation of the entries in the Register for Abraham. The 'B-NY' means that he was born in New York 16 Jul 1914. The 'A-NY' probably means that he entered the Army from New York. The "BSM PH" are Bronze Star Medal and Purple Heart which you know. He graduated from the 'Infantry School Advanced Course' in 1948. He had enlisted service in the Army from 4 Apr 1941 to 7 May 1942. He became a 2LT in the Army of the United States (AUS) 8 May 1942 and was a Major in the AUS 6 Apr 1949. I would say that he was integrated into the RA 7 Apr 1949. Then they show his adjusted RA DOR (date of rank) for 1lt as 16 July 1946 and as Capt 1 July 1948. And they cite the authority as PL 8236."